Get the help you need today. Sign up for my Life Coaching services to find yourself, improve your habits, find direction, fulfillment and satisfaction in life. Allow me to help you improve your relationships or enhance your spirituality. I can help you get what you want out of life. For more information about my Life Coaching Services, please click here. I'm available to do a variety of presentations, including seminars, lectures or workshops in the Virginia, Washington, D.C. and Maryland areas. My focus is primarily self-help, including such topics as self-empowerment, stress and anger management as well as general life skills classes. I also speak about spirituality from a Christian-centric point of view. I have a Master's Degree in Clinical Mental Health Counseling (CMHC), am MBTI-Certified and am a full-time Instructor. Daily meditations and positive affirmations to help you stay healthy and well-balanced. Stylish and affordable fashion accessories, including jewelry, scarves, pashminas & more! Daily doses of inspiration, encouragement and advice to help you get through those tough times. Remember your strength, be reminded of your resilience and find solace and peace. 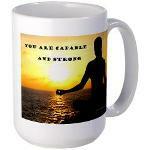 Start your day off right with our Daily Meditations Mug - You are Fearless! You can do whatever you set your mind to do. You can get a new job, start a business, be happily married or take up a new sport. All it takes is your belief, persistence, dedication and follow-through. You were born with an innate energy and drive to succeed. You have what it takes to make it. Believe in yourself. Take the steps necessary to see it through. Accomplish those things you set your mind to do TODAY!